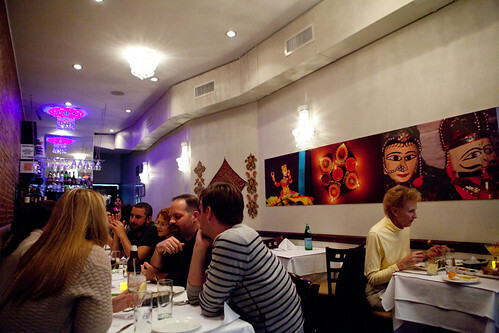 Papadam located in the Upper East Side is one of the fewest neighborhoods I would imagine having very good traditional Indian food at a very reasonable price that we went on a recent Saturday night. 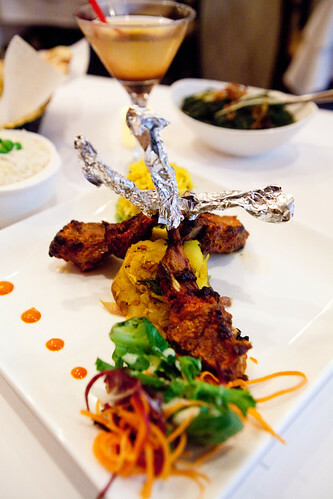 Admittedly, I’m a novice to the realm of Indian cuisine but I am fascinated by the complexity of flavors and spices used in their food and I think this restaurant is a good stepping stone. This narrow restaurant that has an exposed brick wall with a long leather banquette looks pleasant and relaxing to be in. We’re presented with their namesake papdam, a thin, crispy cracker with a duo of dips (one being pungent and herbaceous, while the other was primarily sweet and made of tamarind and dates) and a sweet tomato chutney. 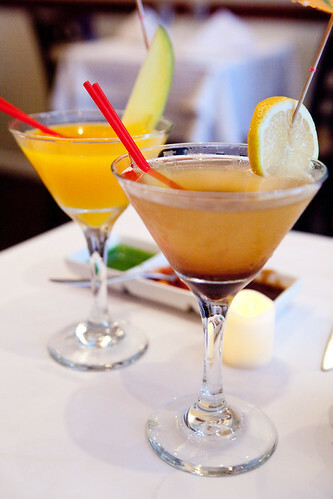 The cocktails we had were the sweet, vodka based mango smooch that was dangerously delicious as the main flavoring ingredient was fresh Alphonso mango puree. My tamarind martini was a stiffer drink that I would prefer in terms of sweetness and I did like the subtle tartness the tamarind imparts on this drink. Our appetizers of mango scallops and Tawa shrimp were very good. 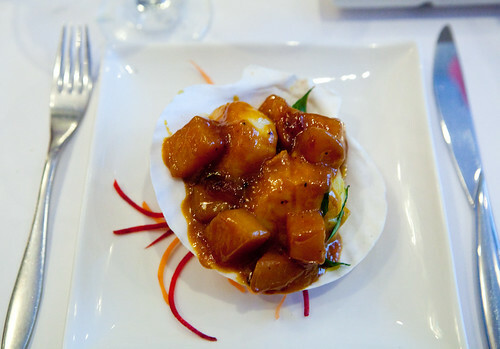 The scallops were large, sweet and perfectly cooked while the cubes of mango delivered a sharp tartness that awakened our palates. 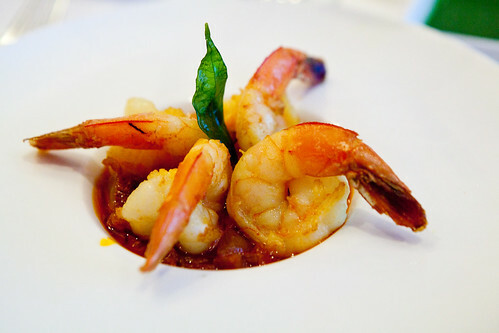 The shrimp were stir-fried with fresh tomatoes, coriander, garlic, spring onion, mustard seeds and curry leaves. Then we ordered a large feast of sorts. 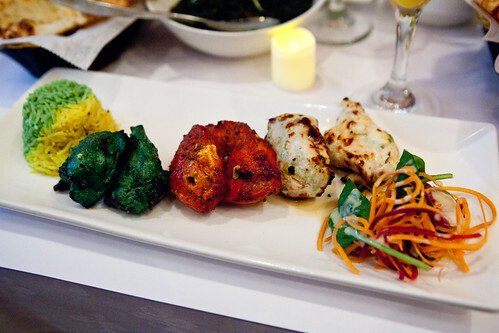 My dining companion ordered the trio of kebabs served with lemon and mint rice were are large pieces of white meat chicken and it’s packed with lots of flavors. The malai (ginger garlic paste), hariyali (coriander, mint, green chili), and gharwali (yogurt, red chili) surprised our tongues as to how flavorful white meat chicken can be (my favorite was the ghawali). I had the Nizami rogan josh, a lamb stew that is cooked in a rich tomato-based sauce but they took out and roasted off the excess sauce (under my preference as I didn’t want soggy rice). The lamb was served with a lovely heap of mustard potato and a side of lemon rice. We also had sides of their fragrant basmati rice, saag paneer (spinach with paneer cheese), and naan (garlic and onion) that blew my mind. I haven’t cared for bread served in restaurants in a while but their naan opened my eyes and didn’t make me care if my entire meal was based on their naan. It was that good. Before we called it a night, we must end with dessert. 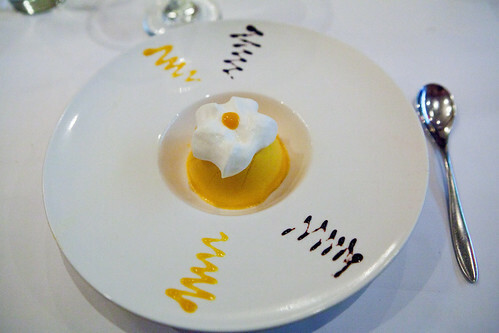 The mango mousse was very delicious, as again, they utilized the irrefutable Alphonso mango puree but it’s firmed up quite a bit that it’s more of a firm, creamy gelatin than a mousse. 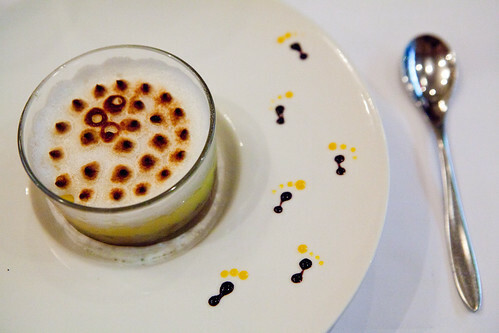 We generally did not care too much on what the kitchen called it the lemon meringue flambé, as it’s more like a lemon meringue pie in a glass and it’s a bit too saccharine for our preferences. 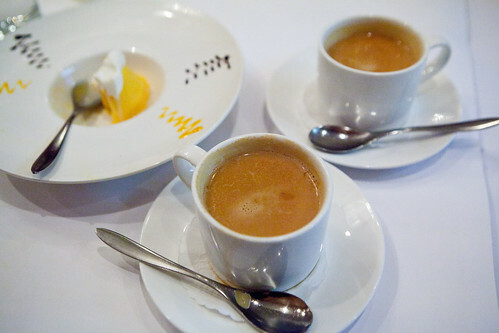 To cap off this meal, we had cups of piping hot, black Masala chai to balance off our indulgent meal. If you’re in the neighborhood and want something interesting beyond the American or bar food that’s prevalent in the area and it’s affordable, I would recommend this spot. 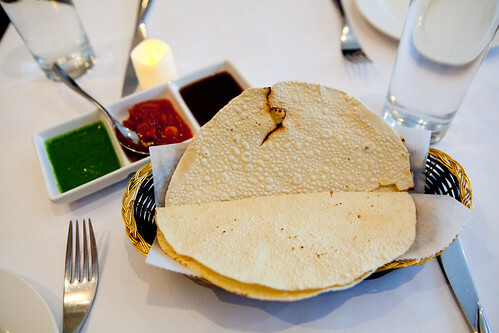 Papadam finally vindicates Indian food. 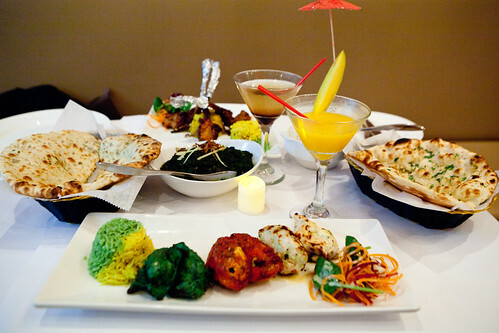 The experience is pure, clean home cooked food which is not a total over kill as most Indian restarants do. The food is not over spiced. You can taste the food. The ingredients are high quality, cooking is expert . The restaurant kitchen is exceptionally clean. The fresh baked breads are authentic. 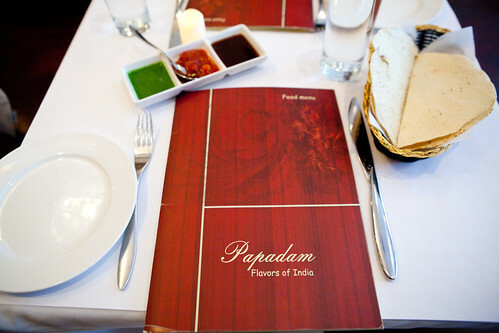 Papadam is a great place to take your familt to for a quiet understated meal of luxury. Very accomodating management. I am a convert.